The True Low Air MAX bed, which is also called the MAX ADVANCED "true" low air loss, has an alternating pressure mattress and pulsation pressure relief system sets the new standard in the prevention and treatment of pressure ulcers. The powerful yet quiet user friendly pump of the True low Air Max produces 1200 LPM (liter per minute) of air flowing directly under the patient. The constant high flow of air keeps the patient cool, dry and virtually free of perspiration. This True Low air loss mattress system is commonly used in many hospitals across the country to keep patients comfortable. Its an extraordinary therapeutic mattress system that is used for a wide variety of patients for optimal comfort, pressure relief, and the healing of up to stage 4 bedsores. The True Low Air Max system supports up to 1000 lbs. and covers the entire spectrum of pressure relief for patient comfort. The Max series pump offers a 10 zone comfort setting that allows pressure to be customized by a patients weight. True low air loss therapy is designed to wick away moisture, preventing heat and moisture build up and protecting the skin from sheering and breakdown. The pro series pump produces 1200 liters of air flow per minute offering a cool and dry sleeping surface. This true low air loss system is loaded with state of the art options and features making it the best available on the market today. In additional to the low air loss therapy the pro max 99 series has added a unique pulsation mode that reduces the air flow every 30 seconds to 50% of the comfort setting. This unique pulsate feature adjusts from 1 minute - 20 minute cycles. This feature adds enhanced comfort and healing benefits and will intermittently reduce pressure and increase blood flow. Heals up to and including stage 1-4 bed sores. Incorporate Alternating Pressure Therapy Mode for Advanced Healing. The user friendly Cycle Time Adjustment allows the patient to control how often the mattress alternates. Easily adjust cycle times from 5-30 minutes. This is ideal for pain management and stage 4 healing therapy. Therapy Modes include on demand low air loss, pulsation feature, and adjustable alternating cycle times. This is the only true low air loss that incorporates all these features including a bariatric mode that can enhance air output for patient support. Get Free Shipping with This True Low Air Max Now! 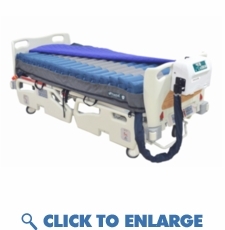 At MedicalAirMattress.com we offer free shipping on all of our medical air mattresses, alternating pressure mattress systems, hospital beds and hospital bed equipment for sale online. The True Low Air MAX bed, which is also called the MAX ADVANCED "true" low air loss, has an alternating pressure mattress and pulsation pressure relief system sets the new standard in the prevention and treatment of pressure ulcers. The powerful yet quiet user friendly pump of the True low Air Max produces 1200 LPM (liter per minute) of air flowing directly under the patient. The constant high flow of air keeps the patient cool, dry and virtually free of perspiration. This True Low air loss mattress system is commonly used in many hospitals across the country to keep patients comfortable. Its an extraordinary therapeutic mattress system that is used for a wide variety of patients for optimal comfort, pressure relief, and the healing of up to stage 4 bedsores. The True Low Air Max system supports up to 1000 lbs. and covers the entire spectrum of pressure relief for patient comfort. The Max series pump offers a 10 zone comfort setting that allows pressure to be customized by a patients weight. True low air loss therapy is designed to wick away moisture, preventing heat and moisture build up and protecting the skin from sheering and breakdown. The pro series pump produces 1200 liters of air flow per minute offering a cool and dry sleeping surface. This true low air loss system is loaded with state of the art options and features making it the best available on the market today. In additional to the low air loss therapy the pro max 99 series has added a unique pulsation mode that reduces the air flow every 30 seconds to 50% of the comfort setting. This unique pulsate feature adjusts from 1 minute - 20 minute cycles. This feature adds enhanced comfort and healing benefits and will intermittently reduce pressure and increase blood flow. Heals up to and including stage 1-4 bed sores. Incorporate Alternating Pressure Therapy Mode for Advanced Healing. The user friendly Cycle Time Adjustment allows the patient to control how often the mattress alternates. Easily adjust cycle times from 5-30 minutes. This is ideal for pain management and stage 4 healing therapy. Therapy Modes include on demand low air loss, pulsation feature, and adjustable alternating cycle times. This is the only true low air loss that incorporates all these features including a bariatric mode that can enhance air output for patient support. Patients that use true low air loss therapy are looking for the best in comfort and healing in a long term care situation. Patients that have had problems with alternating pressure mattress that bottom out in the middle. This mattress system uses a blower based powerful pump that won't sag in the center of the mattress. Patients that are looking for the best in comfort through the use of pulsation therapy, alternating pressure therapy and on demand low air loss. Patients looking for the best mattress for long term care.